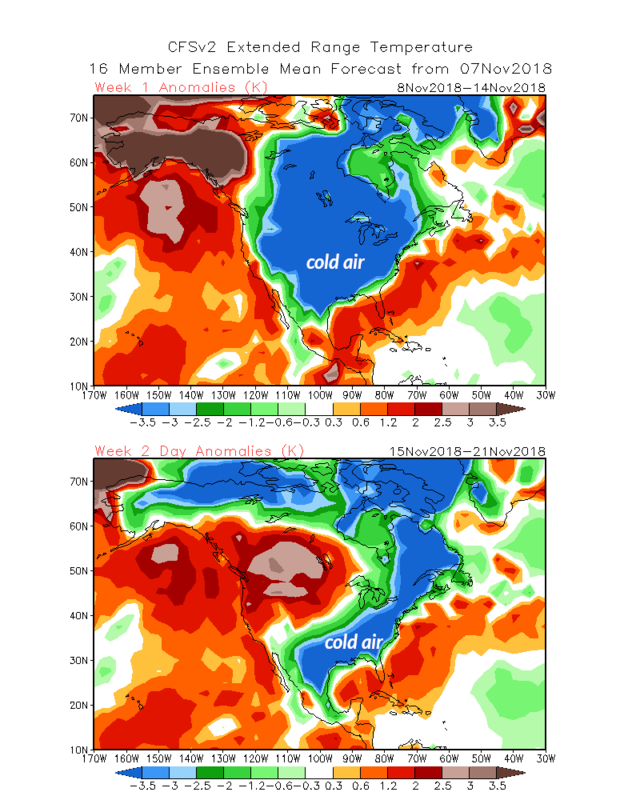 Today, we kick off our seventh annual winter outlook series by looking at the state of the oceans and atmosphere entering the winter, along with how these features could affect our weather in the coming months. After last winter's La Niña event that saw cooler-than-normal sea surface temperatures in the equatorial Pacific Ocean, the ENSO phase has since reversed. Over the summer and fall, the waters have warmed across the Pacific, putting us on the verge of weak El Niño conditions entering the winter. It's been a decidedly late-emerging El Niño this year, and we've only recently begun to see the typical atmospheric impacts such as a slackening of the easterly trade winds and negative outgoing longwave radiation anomalies, which is a sign that cloud cover and thunderstorm activity is building across that region and allowing less radiation to escape back to space. 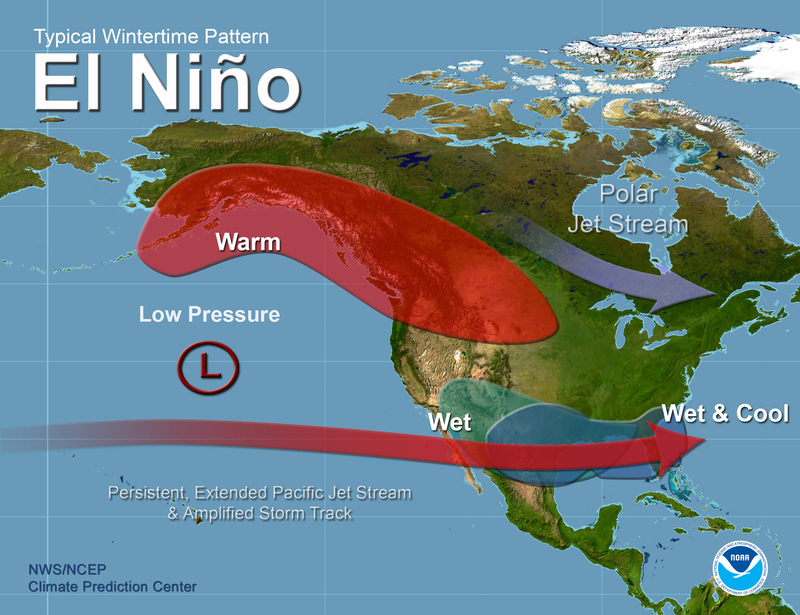 We do have confidence that this El Niño will continue to build entering the winter. A substantial warm bubble beneath the ocean's surface should reinforce those above-normal sea surface temperatures, and most climate model forecasts are in agreement that we should see a weak to moderate El Niño lasting throughout the winter. That's likely to mean a wet winter in North Carolina. Because the jet stream derives its strength from south-to-north temperature differences, the warming water and air near the equator helps make for a more robust subtropical or Pacific jet stream that tends to stay just to our south, bringing in moisture and storm systems from the Gulf of Mexico. This El Niño is a bit unusual since the greatest sea surface temperature anomalies are in the central and western Pacific rather than right off the South American coast. Sometimes called a Modoki El Niño -- "Modoki" is Japanese for "similar, but different" -- the shift in the location of these strongest anomalies and the low pressure they induce often causes some differing effects downstream. 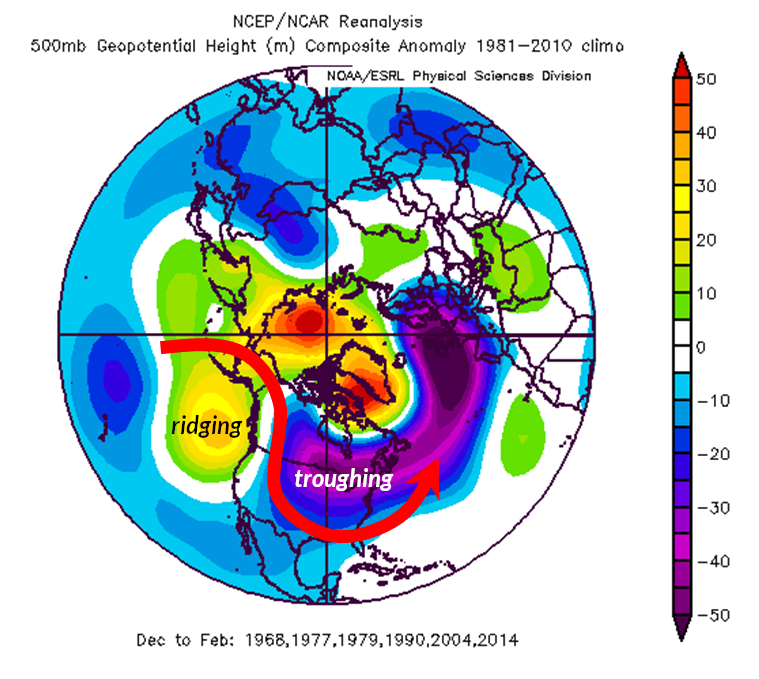 Historically, strong Modoki El Niño years tend to see more ridging of the polar jet stream over the western United States and troughing over the east coast, which can favor cooler weather for us. As we'll show in our next post, though, some of the most similar past years to 2018-19 have seen quite a bit of jet stream variability with this type of pattern. Another Pacific pattern with some long-range predictability is the Pacific Decadal Oscillation, or PDO. 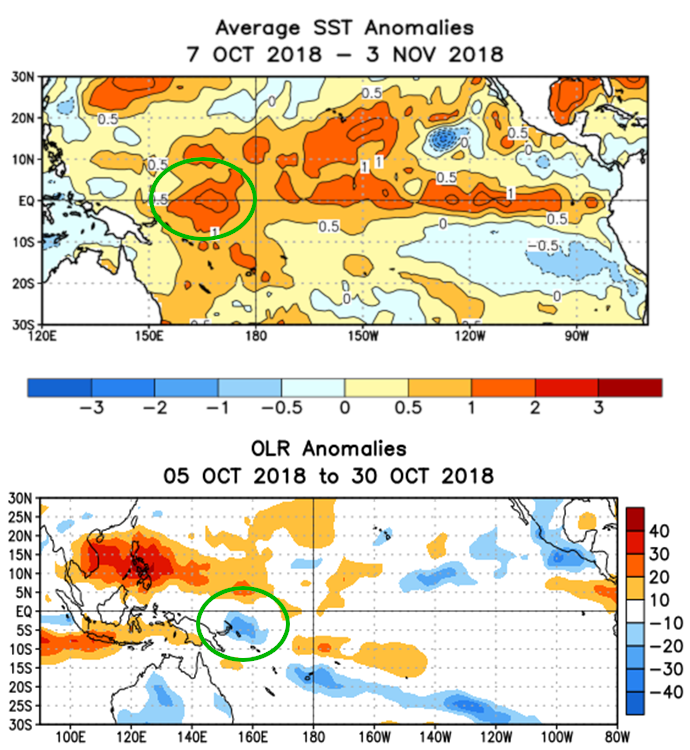 While ENSO is defined by sea surface temperature anomalies in the equatorial Pacific Ocean, the PDO looks at the northern Pacific, where those anomalies tend to change between warmer than normal (positive phase) and cooler than normal (negative phase) roughly every 10 years. We've been in a positive PDO phase since 2014, but this summer, the horseshoe of warmer water off the US west coast, along with a pool of cooler water north of Hawaii, have eroded. That has put the PDO phase near neutral entering the winter. 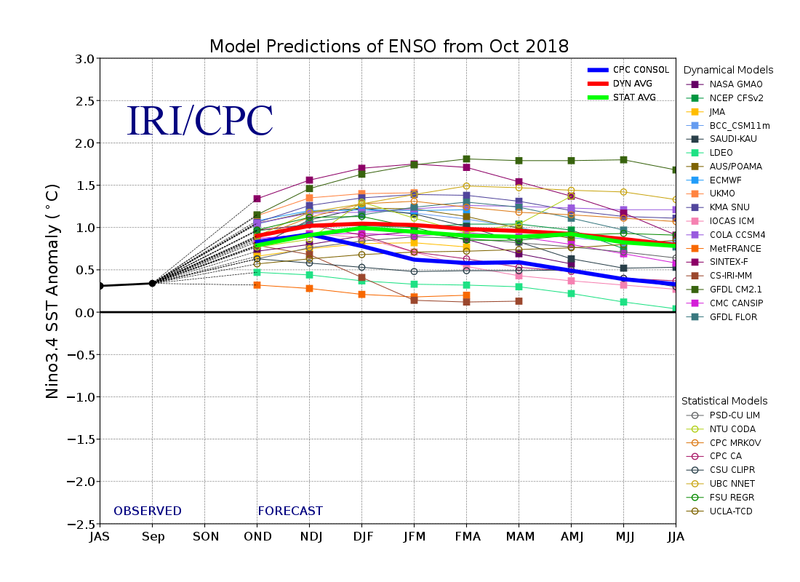 While the PDO being in the same phase as ENSO can amplify the typical ENSO impacts on the US, the current and expected ongoing neutral PDO conditions likely won't have such an effect this winter. Along with patterns that shape the subtropical jet stream, we also often look at atmospheric features that affect the polar jet stream since we typically need it -- and the polar vortex that it surrounds -- to be weaker and more wobbly to bring shots of cold air southward into North Carolina. The polar vortex is strongest when the surface is warm and the upper levels of the atmosphere are cold, so any features that can cool the surface or warm the upper levels can cause such a weakening. 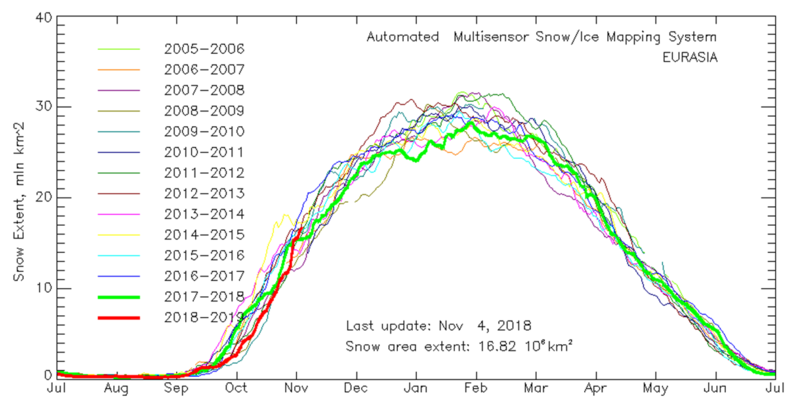 One relatively new and still somewhat controversial theory contends that a rapid increase in snow cover over Siberia in the fall can have that sort of effect. Snow cools the surface while the latent heat released due to condensation and freezing in the clouds warms the upper atmosphere. This October, snow cover in Eurasia got off to a sluggish start but finished with a particularly snowy week. The average monthly snow cover ranked as the 23rd-highest in the past 52 years, slightly above the historical average. However, it's the rate of increase -- not the average amount -- that is said to be a more important factor. Such a rapid spike at the end of the month may have already had an affect on the polar jet stream. This week's cooler weather -- including the first freeze across much of the state -- is due to a shot of Arctic air diving southward. 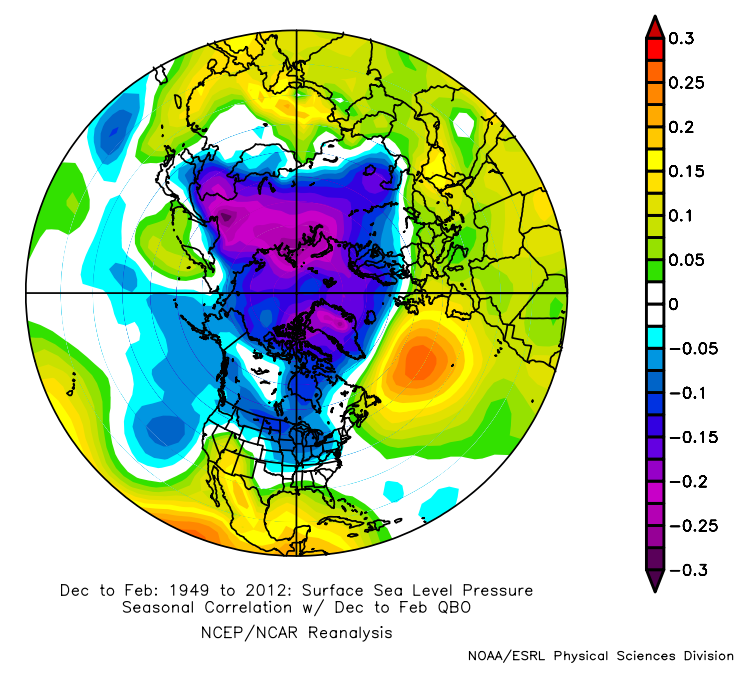 Sure enough, the polar vortex has become weaker and more segmented. While predictability is low beyond the end of November, it's possible that additional weakening events could occur within the first half of the winter, leading to more cool air across the Carolinas. 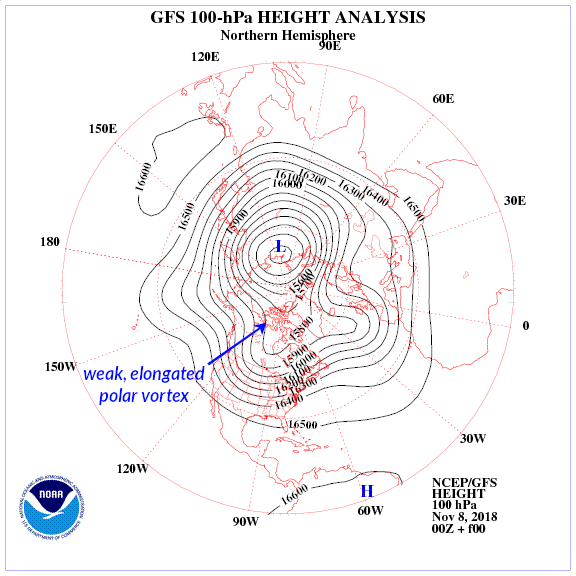 While Siberian snow cover appears to affect the polar vortex from the bottom up, another feature can impact it from the top down. Winds in the stratosphere descend to the jet stream level every few months and can either reinforce or oppose the polar jet stream. These winds, which are describe by a pattern called the Quasi-Biennial Oscillation (QBO), tend to cyclically switch between westerly (positive phase, and in the same direction as the jet stream) and easterly (negative phase). During winters with a negative QBO, those easterlies migrating downward can weaken the jet stream, giving us a better shot at cold air outbreaks. It's far from a guarantee, though -- the correlation between the QBO and seasonal pressure anomalies is relatively weak, suggesting that it only explains a small portion of our wintertime weather variability. 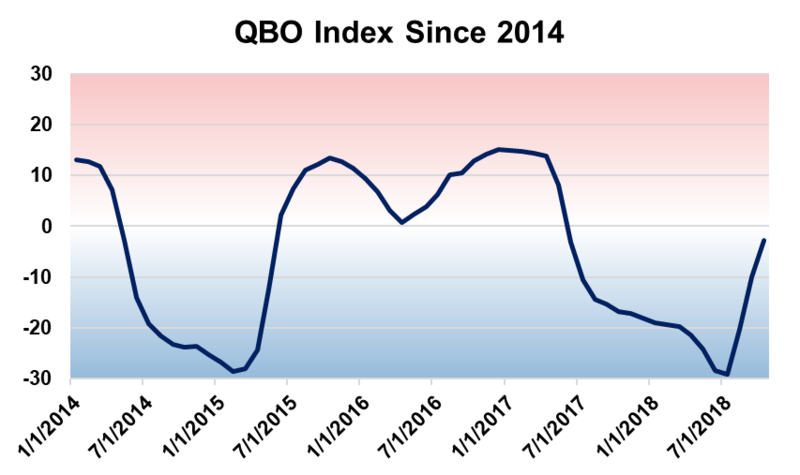 The QBO has been negative since last summer, but recently, it has been trending back toward neutral. That's likely to neither strengthen nor weaken the polar vortex this winter. With these patterns in mind, in our next post on Thursday, we will look at past years with similar conditions and make our predictions for the coming winter in North Carolina.